Show support and raise breast cancer awareness with this Love and Hope Awareness Hat. Wear this great Breast Cancer Apparel at your next fundraising event to show support for all women who have breast cancer. 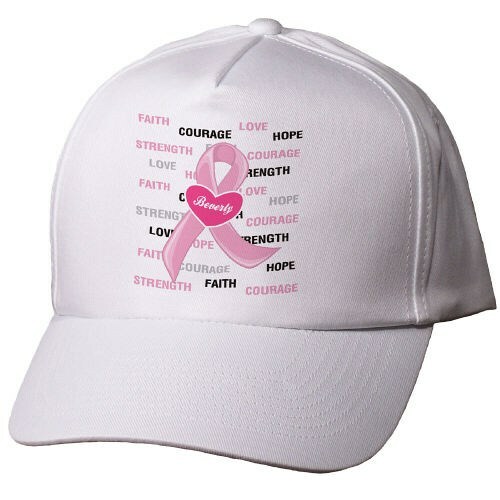 Our Personalized Breast Cancer Awareness Hat is printed on our premium white cotton/poly Hat with adjustable back strap for a one size fits all. This Personalized Hat for the Cancer Supporter includes FREE Personalization! Personalize your Awareness hat with any name. MyWalkGear.com is determined to do what it takes to fight breast cancer. For each Personalized Breast Cancer Gift that is purchased, MyWalkGear.com, will proudly donate a portion of the purchase made to the Breast Cancer Awareness Foundation.